This new edition stems from the work of the International Bar Association Committee on Business Organisations, and is a welcome and timely successor to the highly successful first edition. Leading international practitioners address the increasingly complex issues surrounding due diligence, disclosures and protection of the buyer and seller in corporate acquisitions practice. 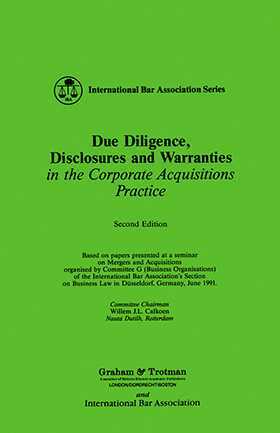 The book also addresses the structure of acquisition agreements, including warranties and the effect of different controlling laws. Environmental due diligence is also included in considering current international commercial practice. Based on a major IBA conference held in June 1991, the work (in this thoroughly updated and revised form) covers the USA, Canada, Germany, England and Wales, the Netherlands, Italy, France, and Japan. As in the previous edition, the material is presented systematically for ease of reference and comparison. The book provides a valuable handbook for practitioners.